It's Friday in some parts of the world and that means Apple's iPhone XS and Apple Watch Series 4 are about to go on sale at the company's retail stores. As in years past, customers started queuing up overnight to be among the first to get their hands on the hot new devices, while others have taken receipt of their early orders. 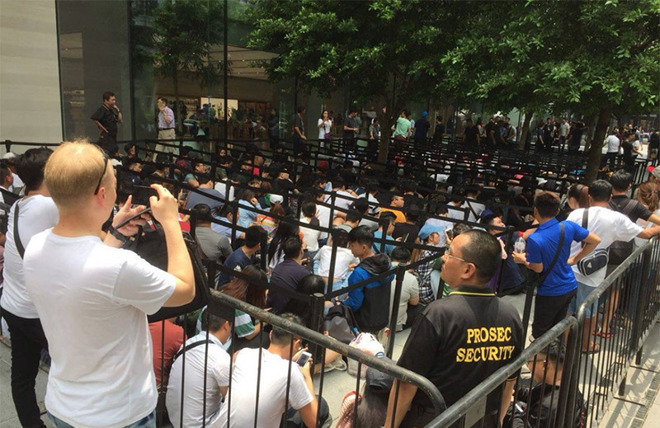 Apple fans currently waiting patiently outside of Apple stores in Berlin, Dubai, Singapore and other countries just west of the international date line are sharing photos of their experience online. Regional media outlets are also covering the yearly event. In Singapore, Channel NewsAsia correspondent Matthew Mohan has been on the scene since outside of Apple Orchard Road Thursday night local time. Around 400 people were in line at around 4 p.m. Thursday, a figure that grew overnight as both locals and visitors filled up the barricades. Security personnel on the scene issued wristbands to customers to indicate their place in line. The provided bands are scanned when a line waiter leaves for an allowed one-hour food break or 15-minute toilet break. According to Mohan, passing showers drenched the area more than once. The Khaleej Times reports a similar scenario in Dubai, where customers are awaiting entry to Apple's store in Dubai Mall. While not as packed as Singapore, the Dubai queue is sizable enough to warrant barricades and security. Berlin, too, saw customers show up on Thursday, with a motley crew waiting outside Apple Kurfürstendamm. In Australia, where Apple Sydney is about to open its doors, the line wraps around the building's corner. Local reports say the queue started to fill up this morning, as not many fans were inclined to brave the weather last night. Customers who ordered online are already receiving their iPhone XS, XS Max and Apple Watch Series 4 shipments. Specifically, people living in New Zealand saw their orders delivered early Friday morning.